Reblog - Willem Toet - A devious way to disguise what is really important? 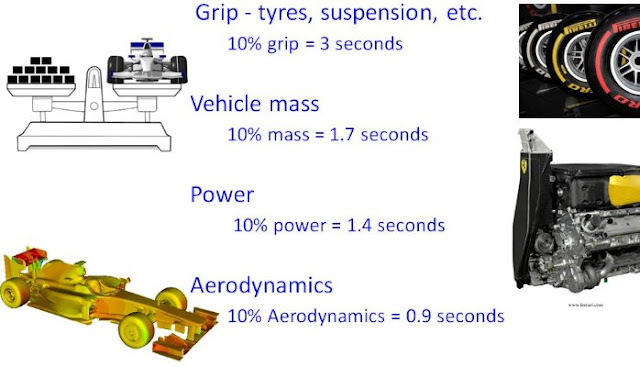 From lap-time simulation teams have learned that, very roughly, if they could change certain engineering performance parameters by a percentage, then they would have the following effects on lap times. The starting point is a recent generation of F1 car on an average present race track. If the race track or the start point changes, these values will change of course, and in some cases dramatically. The truth is that it is the aerodynamics and the powertrain that today make the most difference. Then only the manufacturer teams decide how much to spend on powertrains so for the rest the key area really is aerodynamics. However let’s look a bit at mechanical grip and tyres first. It may appear that we can almost discount tyres because they are very carefully distributed to teams in a fair way so are as close to equal for all as you can realistically expect. Now this does not mean that different teams can't get more or less from the tyres. Suspension systems have to be “passive”. They can only react to the forces exerted on them. However teams have effectively created ways to make the suspension soft initially and harder as bump travel (position) increases. They have blow off systems for kerb strikes and mass dampers to combat the natural frequencies of the tyres & vehicle. In addition they have found ways to provide a more supportive platform for the aerodynamics that are created than it may be believed possible. The removal of links between the front and the rear hurt some teams more than others which told everyone how beneficial these systems had been. Since then (and that wasn’t long ago) other ways have been found of doing something almost as good. Lots of work is done on suspension kinematics and various aspects of installation stiffness to maximise the potential of the aerodynamic package to deliver the grip. Regrettably for the mechanical grip gurus it does turn out that significant compromises have to be made on the mechanical side so that suspension systems provide ways of overcoming aerodynamic realities such as increasing front downforce as ride height reduces but a different relationship between height and power at the rear of the car. Supporting the aerodynamics gets more lap time benefit than is lost through compromises in pure mechanical grip. I'll talk more about aero in later posts but the cars (they're getting fat nowadays as they're over 700Kg) generate literally tons of downforce - many car weights worth. Aerodynamic work can also directly help a team to use more (or less) of the potential of the tyres. 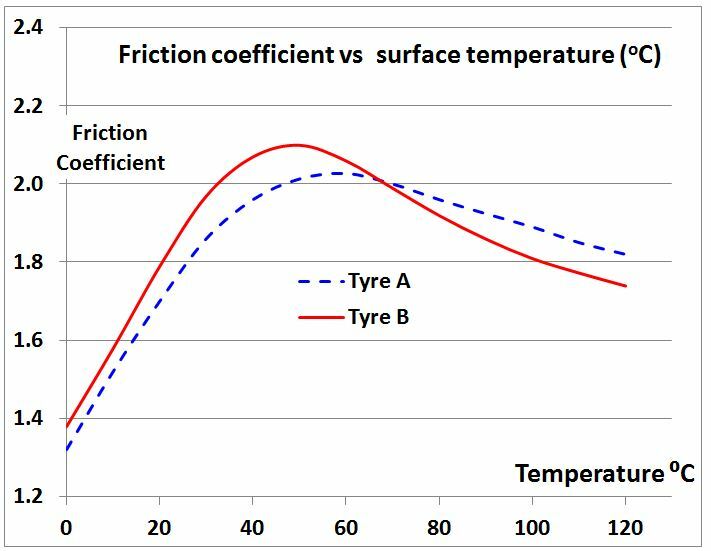 Of course some of this is by generating downforce to “work” the tyres but that could just as easily be a negative as a positive (too much load leading to too much temperature). No, I’m talking about playing a part in managing the bulk temperature of the tyres via aerodynamics. The main methods used are to cool the rim or heat it. This involves using “brake ducts” to wash ambient air or hot air around the surfaces of the wheel. 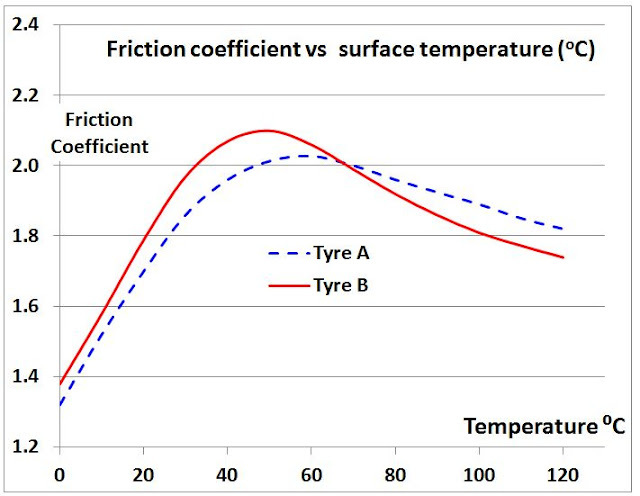 This can make more than 10 degrees difference to the tyre bulk temperature and can make the difference that puts or keeps the tyre in its “window”. This paragraph has been added as a response to a question. If you use the aerodynamics to provide maximum rim cooling or maximum rim heating then you cannot also provide maximum brake cooling. Max brake cooling would give a medium level of rim heating. Perhaps makes it more understandable why some of the best teams appear to have brake cooling issues - they're almost certainly pushing the boundaries to get the best out of their tyres (tires in American English :-) ). The most difficult combination is to provide max rim (tyre) cooling combined with max brake cooling. Max rim cooling is achieved by completely encasing the brake system and taking all hot air from the brakes and ducting it back inboard. Then take a separate duct of cold air and swirl it around all the inner surfaces of the rim. It remains true that the tyres are important but the fact that changing their friction by percentage is the wrong way to assess their relative importance when it comes to deciding where to spend your development budget. I’ll try to cover the other subjects in this short list in other posts – this post is already too long.